In 1991, the Abbot of Vatopaidi Monastery, Archimandrite Ephraim, and fathers of the Monastery went to Ithaca and, with the help of the inhabitants of the island, identified the place of the Saint’s grave. They arranged with the Metropolitan of the Diocese for the translation of the Saint’s relics on May 23rd of the following year, 1992. News of this forthcoming event soon became known to the people of Ithaca, as well as to the faithful throughout all of Greece. Abbot Ephraim, with two fathers from the Monastery, went to Ithaca on the appointed date. With the blessings of His All-Holiness Bartholomew, the Ecumenical Patriarch; with the assistance, solidarity and cooperation of Metropolitan Nikiephoros of Lefkas and Ithaca; and with the ardent help of the officials and residents of the island, they were able to carry out the translation of the Saint’s relics. This Divine Liturgy was attended by numerous priests and monks and a multitude of people who had thronged together to attend this historic and joyous event. Following the Divine Liturgy, they began the process of the translation. At the Saint’s grave, which had been transformed into a small chapel, a few of the faithful began breaking up the flooring with sledgehammers, while the rest of the people were exuberantly singing “Christ is Risen.” Indeed the event was Resurrectional and fitted perfectly with the Paschal period of the Pentecostarion, in which it took place. Soon, amid a general atmosphere of pious emotion, monks who were digging at that moment found the first piece of the holy relics and, shortly thereafter, the Saint’s holy skull. Finally, they gathered all of the pieces of the holy relic and in accordance with the usual ordinance, they were washed and arranged. 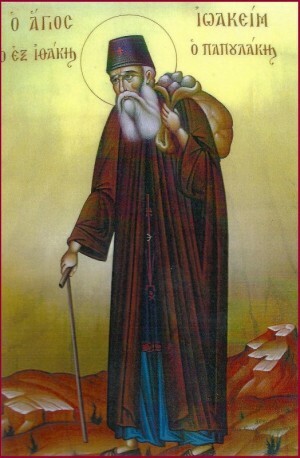 It is worth pointing out that Saint Joachim had prophesied, “A priest from the Holy Mountain, with a red beard, will take me up [his relics] and be the first to bring me to the people.” This prophecy indeed came true in the person of the Abbot of the Holy Monastery of Vatopaidi, Ephraim! It is also noteworthy that the Saint had appeared to a priest in his sleep on the eve of the translation. 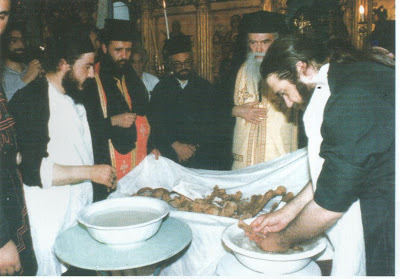 He told him, “During the translation, I will satisfy everyone.” In fact, initially there was a dispute about who had the right to take the Saint’s skull: the Monastery of Vatopaidi or the Diocese. In the end, however, there was no problem; as soon as they removed the grace-filled skull of the Saint from the grave, it split in two! That same day, Abbot Ephraim and his company set off for Vatopaidi Monastery, arriving the following day. The brotherhood reserved an especially warm reception for the Saint, who was returning after nearly 170 years to his beloved monastery, which he had abandoned in order to serve the people of God, particularly in his native homeland of Ithaca. In 1998 Saint Joachim was recognized for his holiness by the Ecumenical Patriarchate, and listed among the Saints of the Orthodox Church. His primary feast is on March 2nd, while the translation of his sacred relics is celebrated on May 23rd.